Othmane Jabri joined Kingdom Hotel Investments (KHI) in July 2011 and is currently Vice President within the Mergers & Acquisition department. In this capacity, Mr. Jabri executes KHI’s value realization strategy by disposing of hospitality assets across Africa, Asia and the Middle East. Mr. Jabri is also in charge of business development, underwriting and analysis of acquisition and development opportunities across the globe working closely with the development teams at KHI’s portfolio brands (Four Seasons Hotels & Resorts and AccorHotels). 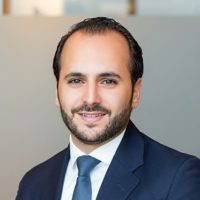 Prior to joining KHI, Mr. Jabri worked for Colliers International in Casablanca (formerly Lance) and for JLL Hotels & Hospitality in Dubai covering the Middle East and Africa region. Within the hospitality industry, he has focused primarily on market and feasibility studies, operators selection and contracts negotiation, valuations, single asset and portfolio transactions and strategic advisory services such as hotel fund set up. Othmane is Moroccan and holds a BA in International Hospitality Management from the Ecole Hôtelière de Lausanne in Switzerland. He speaks Arabic, French, English, and Spanish.